It’s an easy feat finding candidates for a job opening, but it can be more difficult finding great employees who add value to your small business. Finding the right fit for your company culture can be challenging-that is if you’re going about it the old-fashioned way. 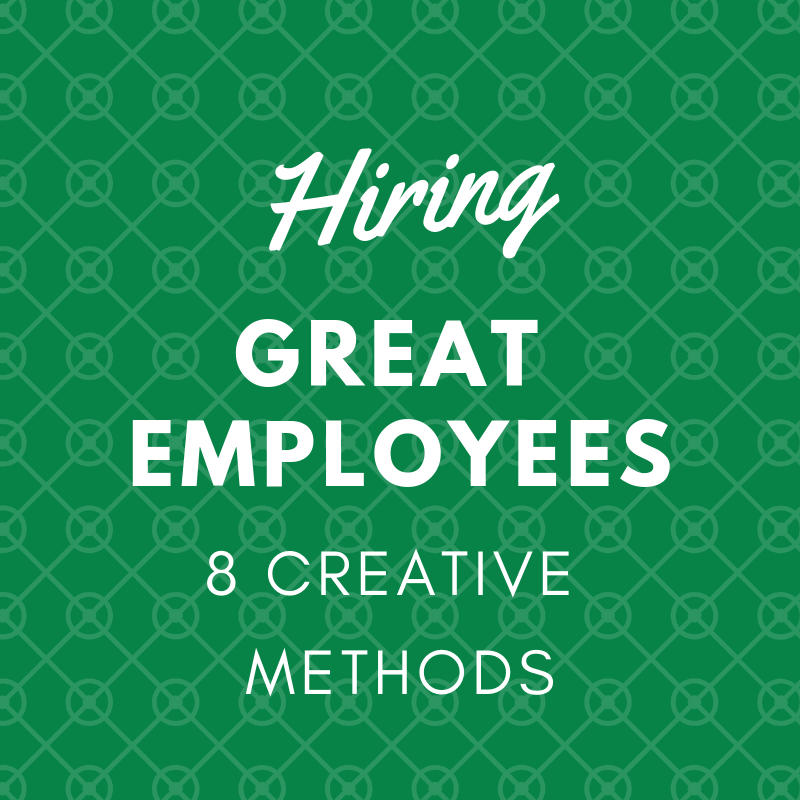 Besides online job boards, such as Indeed and CareerBuilder, here are 8 creative approaches to finding that needle in the haystack. Turn to your personal network to find good employees. Ask friends, colleagues and former colleagues who know you and your business well. Depending upon how well they know your organization, personal contacts are prone to recommend the right type of candidate who would be a good fit with your business. Also check LinkedIn, Twitter or Facebook if you are interviewing a particular candidate to see if there are any mutual connections you may have and tap them for a recommendation. Encourage your current employees to refer applicants for job openings. You may even encourage your employees to spread the news about open positions on Facebook or LinkedIn. For example, have them post a quick message, such as “We’re looking for a great copywriter who wants a relaxed, family-friendly place to work. If you know of anyone, please share my contact info!” This method helps ensure you end up with hard-working employees that fit your company culture, and the referring employee gets a nice bonus if the candidate works out. Don’t be afraid to reach beyond your geographic barriers for candidates! Technology allows us to connect with people nationwide and around the globe, to communicate and collaborate—working with employees is no different. There’s no reason a copywriter, for instance, needs to be physically located in your community. Your potential labor market will grow exponentially if you look beyond geographic limitations. When you post job listings using online job boards, you may notice they tend to quickly get pushed down the ranks and disappear from view within a matter of days. Indeed lets you sponsor your job postings so they stand out from the crowd and appear at the top (and bottom) of search result pages for as long as you’d like. This helps you get more quality job seekers so that you can quickly fill your ranks with top-notch applicants. As a matter of fact, Indeed happens to offer a free $50 ad credit. Take advantage of it by clicking here. Some of the best candidates for your job opening haven’t graduated yet, and to find out who they are, you may need to cozy-up to the college dean or local university professors. Don’t be afraid to give them a quick call and ask about top students they would recommend for your firm. Some colleges have a bulletin board where open positions are posted, or better yet, a dedicated placement resource to assist students in finding jobs. Get to know these folks, and you’ll get a pipeline to the best graduating candidates that may be perfect for your company. Also consider a paid internship program, as these types of arrangements farm the brightest and most talented seniors or grad students from colleges and universities. This allows you to test the waters a bit and find out which of the interns are power players, so when they graduate, you can pluck them up the minute they walk off the stage with their diploma. We have a few colleges/technical schools who are Shoreline Chamber of Commerce members you can tap right away! Branford Academy of Hair & Cosmetology, Gateway Community College, Albertus Magnus College. There are associations and organizations related to every type of field under the sun. Look for local chapters in your area and get involved in their events and meetings. If an association has accreditations or a certification process, then you know you can find potential employees with the skill set needed to perform a certain level of the job. Plus, potential candidates tend to be current with the skills and aptitudes required for their field. Yes, you heard right. Craigslist is a viable HR resource! Localized sites like Craigslist often work well for service industry job postings — like restaurants, retail, home services and local mom and pop shops. A posting can range from free to $35 in major cities. You might receive 50-100 resumes. But make sure you use a separate email address to receive applicant resumes, and leave your phone number off the job posting unless you want to receive tons of applicant calls. If you’re in a service or delivery industry, you’ve got a great advertising vehicle-your vehicles! Why not use them to help you recruit your new hires. Prospective employees may even approach the driver of a vehicle and ask, “hey, what’s it like to work there?” Qualified people working in your community may see your sign and ask about a job, and you’d be surprised — if your current employees are happy, they’ll be your best recruiters! Got some other ideas for your fellow members? Post them here under comments. Happy Hiring! Interested in writing a guest article for the Chamber? Email sheri@shorelinechamberct.com.